Many college students crave the attention and affection that can be generated from friendly canines, while their schools make it difficult to own and care for one. Most dormitories and on-campus residential halls only allow pets such as fish, while banning dogs, cats, hamsters and most other animals. This could be due to the fact that hall residents could have complications relating to allergies, noise, and filth. It could also be detrimental to the animal to live in a condition where they could be among hazards with little space to roam. Some students living in off-campus housing are denied the opportunity to house a pet as well, given the threat of large fines and sometimes eviction. Many rental companies require their residents to sign a lease agreeing to no-pet policies. Others require a high-priced fee be paid for each animal being housed within the residence. There’s also a chance of a pet causing major damages, which would yield yet another fee. Yard space is also an issue since off-campus college housing is usually in the form of apartment complexes; the doggies don’t have much room to play. Although there are many college students who are responsible enough to own and care for a dog, there are also many that neglect to care for their dog in a proper manner. From a financial aspect, college students typically do not have enough money to afford a dog and all of its fees and needs on top of spending their money on school, textbooks, rent, groceries and more. 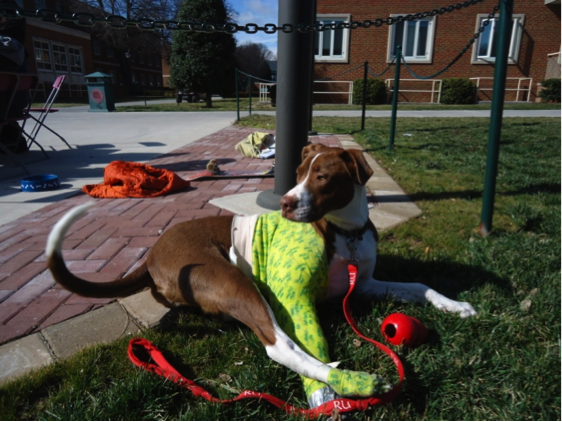 With spending money to spare, some college students are unable to afford quality pet nutrition, vaccinations, procedures and veterinary appointments which can lead to serious health problems for their dog. A lot of time must be dedicated to a pet dog. Their walks, exercise, training, eating, and appointments all must be scheduled. College students are generally under a tight schedule with classes and also add on extra-curricular activities. What does the dog do while a student is gone all day long? Unfortunately, the dog is usually crated or locked inside for long hours of the day with a lack of necessary attention. Many don’t oppose the idea of owning a dog in college, but hope people can think of the animal before themselves. From this point of view people believe if an individual is unable to devote their affection, time, energy, and large portion of their life to their dog, then it’s unfair to the dog to be under their care; they see this as abuse. Dogs can be a great companion and stress-reducer for students, but can also be a worrisome hassle. Make sure you can be dependable for your doggies! Previous PostThe StruggleNext PostPluto is back!